Christmas Late Opening was busy and at times extremely busy, as we now expect! 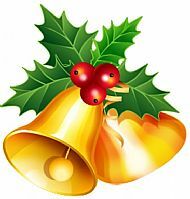 A successful and fun time for us, and a lovely way to kick-start the Christmas bonanza. We had mince pies, and fizzy, and laughter - and sold plenty of books to boot. Civilised Saturday on the following day -26th- really was just that, with a much more measured pace and relaxed atmosphere. And mince pies of course. We had an exploring adventuring theme this year for our literary events during BLF, with the exception of the Dastardly Dinner which explored the finer points of forensic science, but which did include maps! 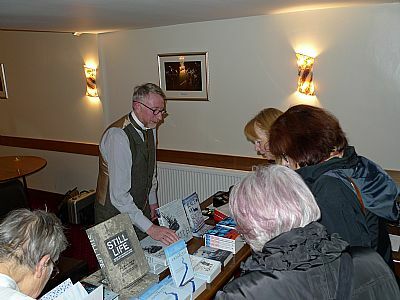 It was a very successful time for us with sell-out events and great audiences. 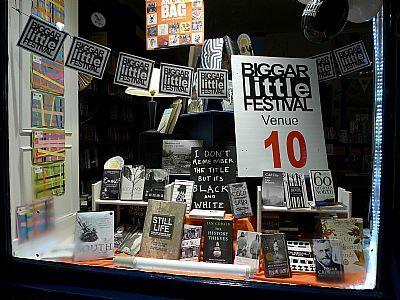 We started Atkinson-Pryce's own Biggar Little Festival events on 20th October with Malachy Tallach presenting his BEAUTIFUL book "Undiscovered Islands". Author of the hugely successful “60 Degrees North” was talking about his new book with the intriguing subtitle – “An archipelago of Myths and Mysteries, Phantoms and Fakes”. Gathered in this book are over twenty islands that have decidedly human origins, whether they are the products of imagination, deception or simply human error. Signed copies now in stock! This will make a seriously lovely present for any book lover. 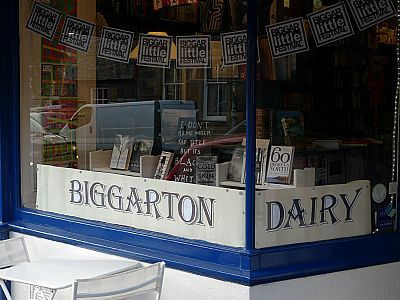 Biggar Day Out was lovely for us - we were Biggarton Dairy for the start of this year's Story Trail and had a busy afternoon with regulars and visitors alike. On Monday 24th October it was "Endurance 100". 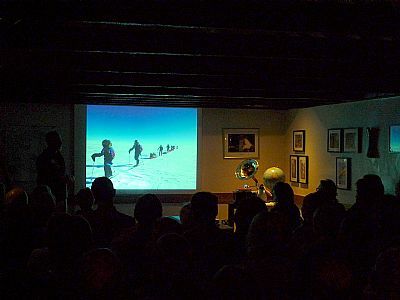 David Crichton Henry drew a packed audience to the Elphinstone for a presentation about the centenary expedition celebrating Shackleton’s Imperial Trans-Antarctic Expedition. Henry co-led the expedition which reached the South Pole successfully on 17th December 2015. The evening also introduced the fascinating story of Scottish naturalist and polar explorer William Speirs Bruce and his contribution to the ‘Heroic Ages’ of Antarctic exploration. Introducing the evening in traditional Edwardian dress to set the scene, Henry concluded by showing lovely slides and telling amazing stories of the recent expedition. 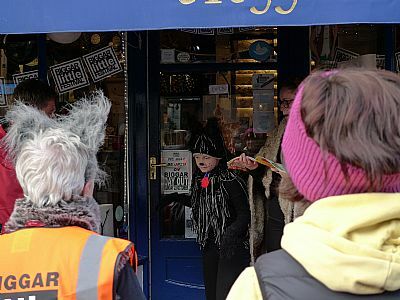 He also showed a talent for bookselling, we are thinking of hiring him! 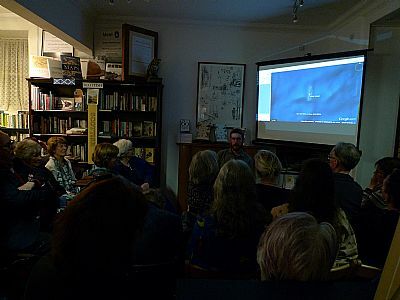 On Wednesday 26th October - another very full house at the Bookshop to celebrate publication of “Scotland: Mapping the Islands”. Authors Christopher Fleet and Charlie Withers did a brilliant presentation about the book, which presents the rich and diverse story of Scottish islands from the earliest maps to the most up-to-date techniques of digital mapping in a unique and imaginative way. (Christopher Fleet is Senior Map Curator at the National Library of Scotland and Charles W J Withers is Professor of Historical Geography at the University of Edinburgh.) Margaret Wilkes, the third collaborator on this seriously lovely book, was also there to sign copies - we have signed stock! With thanks to Birlinn Publishing for their support. On Saturday 29th October the Dastardly Dinner was delicious, followed by a reading from "None But the Dead" and talk by author Lin Anderson, then an equally enjoyable and riveting talk by Professor Lorna Dawson on forensics which led to a thought-provoking discussion about the nature of evidence, justice and the law. We have signed copies of "None But the Dead", with thanks to Macmillan for their support. BOOKSHOP DAY! 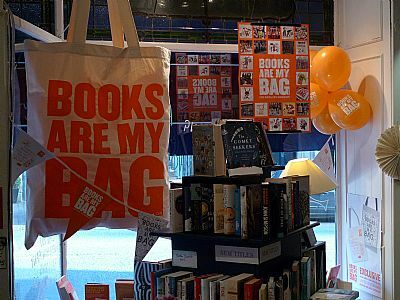 - The Books Are My Bag campaign rolls from strength to strength with the launch of the first Bookshop Day. 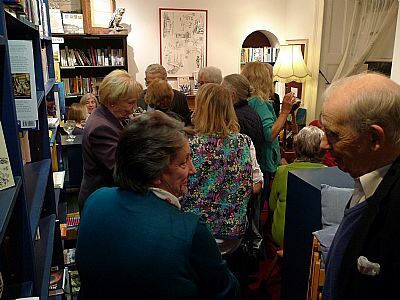 Many came to join us on Saturday to celebrate Atkinson-Pryce and bookshops everywhere. All things were orange, including the cake (which was chocolate too, yum). David Bodanis, author of "E=mc2: A Biography of the World's Most Famous Equation", was at Atkinson-Pryce for the Scottish launch of his latest book, "Einstein's Greatest Mistake". Futurist, speaker, business advisor and author, Bodanis chose Biggar for the first date on his Scottish tour. The author spoke well - and passionately - about the book and associated subjects with interesting questions from a very engaged audience. Author Margaret Dunlop was at Atkinson-Pryce for a Biggar launch of "Goodbye Berlin", her biography of husband Gerald Wiener. Former Biggar residents, Atkinson-Pryce welcomed Margaret and Gerald to the bookshop for an evening to celebrate publication of "Goodbye Berlin". There was a good turnout and a lovely time for many catching up with their old friends. Catriona McPherson paid us a visit with her new Dandy Gilver novel "Dandy Gilver and a Most Misleading Habit". But we were also celebrating the UK publication of a stand-alone contemporary crime novel "The Child Garden". As always we had a lovely evening with the author, and we loved the dress! The Child Garden has been shortlisted for no less than 4 awards in the USA. "If you like your thrillers twisty and twisted, you'll love this" Val McDermid. Let's Make A Beeline visited Atkinson-Pryce Books. Meg Beresford paused on her beeline and was joined by Andrew Whitley, author of Bread Matters, and Veronica Burke who talked about the importance of bees, organic cultivation, real bread and much more. Beeline is the brain-child of Meg Beresford, self-professed "aging activist, constant gardener, daily dog walker, un-retired charity worker, nature connector, mother and grandmother, looking ahead to the future.” Meg is raising funds to create a festival of the bee next spring at Wiston Lodge. Atkinson-Pryce was really happy to hand over the ticket money from Monday evening to help the cause. 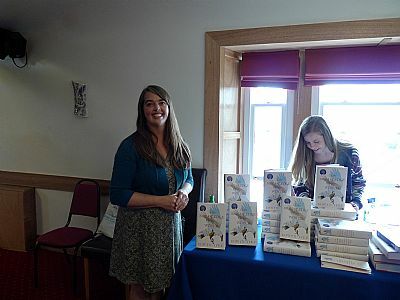 Eowyn Ivey was back in Biggar! Author of "The Snow Child" returned for a literary lunch at the Elphinstone Hotel to launch her new novel "To the Bright Edge of the World". Four years since "The Snow Child" became a global sensation, selling over three-quarters of a million copies world-wide, author Eowyn Ivey has launched her highly anticipated second novel, "To the Bright Edge of the World". Pulitzer Prize finalist Eowyn Ivey has managed to once again capture that subtle, potent strand of magic that enchanted so many readers of The Snow Child. Once again, she charmed her Biggar audience. 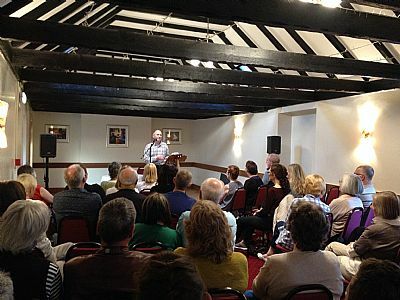 Lovely James Robertson was back with us in Biggar for the VERY FIRST OUTING of his new novel "To Be Continued..."
What a delightful evening. James has always shown a capacity for humour - and now he has written a comic novel - a gloriously surreal romp about the important things in life: friendship, romance and a fine malt whisky! As a finale to the event, by special request, James read his story from "365 Stories", "The News Where You Are" - incisive observation and hilarious wit rolled into a couple of minutes which had the audience hooting with laughter. Atkinson-Pryce, and indeed Biggar, are proud to have the Brownsbank connection with James and love the fact that he comes back to us for every book - and other events. Signed copies of the new novel, and his backlist, now in stock. The Bookshop Band at Atkinson-Pryce. 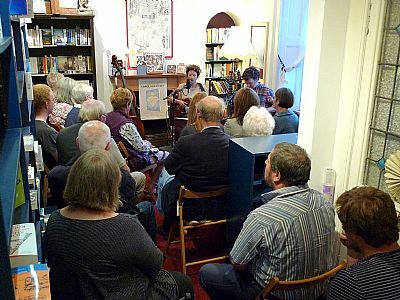 For something completely different, totally unique and rather wonderful... We had a delightful evening with Beth and Ben at the bookshop performing their songs about books to a packed audience. These talented musicians have achieved critical recognition and have played venues as varied as Glastonbury and the Pompidou Centre - as well as touring indpendent bookshops! We have a small selection of their CDs in stock. To find out more about them visit The Bookshop Band website. 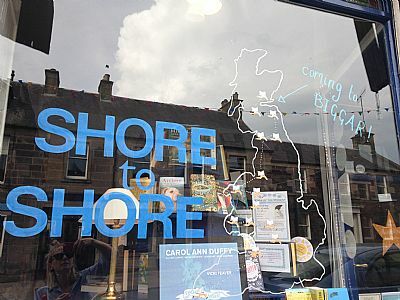 The amazing Shore to Shore event was a SELL OUT here in Biggar. We had the most fantastic evening filled with laughter, tears and joy while listening to beautiful Poetry and celebrating Independent Bookshops across the country. 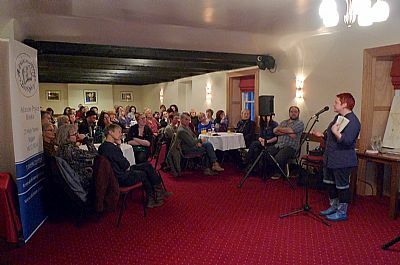 Carol Ann Duffy, Jackie Kay, Gillian Clarke, Imtiaz Dharker, Vikki Feaver and John Sampson were the rock and roll of poetry and made Friday a night to remember for everyone. A huge thanks to our guests and everyone who attended - we have some signed copies of a range of their books, including the wonderful 'Off the Shelf' exclusively for independent bookshops till September, so don't miss out and get your copy now! Many thanks to Magnus Linklater and Robin Gillanders for a fabulous evening about the extraordinary little garden in the hills near Biggar! 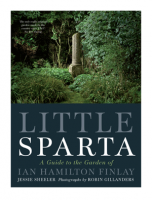 A fascinating presentation and knowledge from them about Ian Hamilton Finlay himself and his realtionship with his garden. Ian Hamilton Finlay’s garden in the Pentland Hills near Edinburgh is widely regarded as one of the most significant gardens in Britain. In addition to being a spectacular example of garden design, it also features almost 300 artworks by Finlay and others which form an integral part of the garden scheme. Quintin Jardine was at Atkinson-Pryce signing copies of his latest Bob Skinner adventure "Private Investigations". 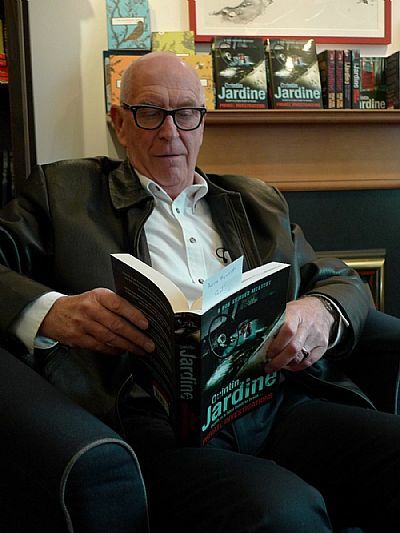 Quintin Jardine's twenty-sixth Bob Skinner mystery sees the Edinburgh sleuth plunged into a gruelling new case in which no score will go unsettled. Former Chief Constable Bob Skinner has uncovered his fair share of crime scenes over his thirty-year career. But few have affected him quite as much as the horrifying sight he finds stowed in the back of a stolen car that collides with his own on the outskirts of Edinburgh. Published in hardback and trade paperback by Headline. 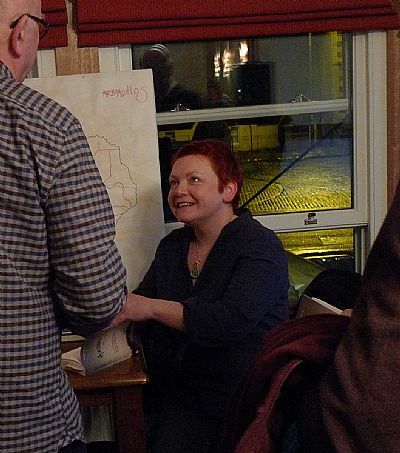 Pauline Lynch joined us at the Elphinstone Hotel for the launch of her debut novel "Armadillos". Successful actor and playwright - and Biggar local! - Pauline Lynch has now written her first novel which was snapped up last year by dynamic independent publishing house, Legend Press, published on 1st April. It was a splendid evening with a full turn-out of family, friends and fans. 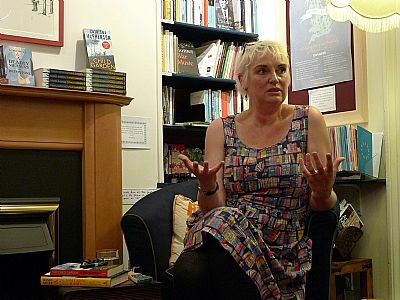 Pauline entertained us with readings, stories of Texas and the creation of "Armadillos", followed by canapes and chat. Many thanks to Legend Press for the wine and canapes. Aggie is fifteen, a ‘sub’ from a ‘sub’ family, one of Texas’ downtrodden. Her father and brother enact that ‘sub’-ness on her, week in, week out. She has only the vaguest notion that there is something wrong with the abuse she endures and instead dreams of the outside world. And then one day, Aggie walks out. But, like the armadillos that flourish in Texas’ barren landscape, she is a survivor. 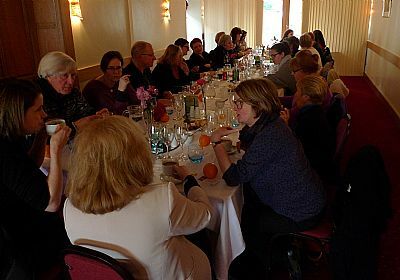 Mary Paulson-Ellis joined us at the Elphinstone Hotel in Biggar for a delicious literary lunch and Biggar launch of her novel "The Other Mrs Walker". We had a very pleasant and interesting afternoon while the author entertained us with her readings and stories about the creation of her debut novel. "Somehow she'd always known that she would end like this. In a small square room, in a small square flat. In a small square box, perhaps. Cardboard, with a sticker on the outside. And a name ..." An impressive debut by Edinburgh author Mary Paulson-Ellis. She has won prizes for her short stories and non fiction and has made an assured move into novel writing. 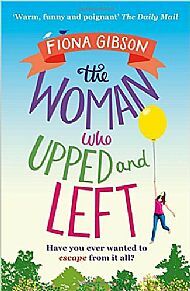 Fiona Gibson joined us to celebrate her latest publication "The Woman Who Upped and Left". It was a lovely evening with readings from the book, discussions and reminiscing. This is a funny, witty and insightful romp so come and get your signed copy now! Audrey is often seized by the urge to walk out of her house without looking back - but she can't possibly do that. She is a single parent. She is needed. 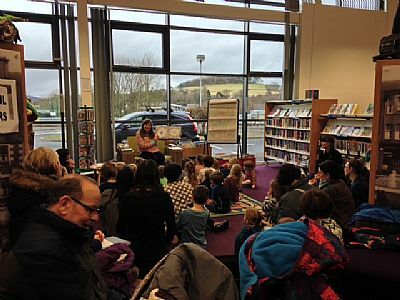 To kick of what is to be a fantastic 2016 the wonderful Emily Mackenzie joined us in Biggar Library to celebrate National Libraries Day on the afternoon of Saturday 6th February with her gorgeous book "Stanley the Amazing Knitting Cat". Great fun was had by all, including Emily: "Just wanted to say a big thank you for having me yesterday and organising a lovely event. Please pass on my thanks to the library too - it was a great turn out and fab to see that Stanley, the woolly wonders and the hot air balloon crafting were a hit!" Emily signed some copies - now in stock at the shop!